Boomshake Music presents a one-class Hand drum & Snare Workshop with Pedro Gomez as a special addition to our BoomShake Drum Performance Workshop (Women, Girls, Trans & Gender-non conforming folks)https://www.facebook.com/events/1410452415862314/ YOU DON'T WANT TO MISS THIS!! We have LIMITED open drop-in spots, so if you are not currently enrolled in our workshop, please email nkeiru@one3snapshot.com with your name, email & phone and to make payment arrangements. In this 2-hour workshop participants will get a hands on opportunity to learn various techniques on hand drums, snare drums and bass drums. We will apply oral traditions and contemporary theory styles of learning to the workshop and realize how both are equally important in any musical setting. We will build community while developing music comprehension and individual expression. Most of all we will be having a fun time playing drums and creating arrangements that can be applied to any existing material. This workshop is at NO ADDITIONAL CHARGE to our currently enrolled participants and $20 for drop-ins. We work to create a welcoming space for people who identify as women, girls, trans and gender non-conforming. A place where people from various walks of life and skills levels can come to recharge, have fun, and learn to make our movements more joyful! We can provide partial and full scholarships for people who find it cost prohibitive. Pedro Gomez has over 15 years of professional musical experience as a performer, educator, recording musician and arranger/composer. 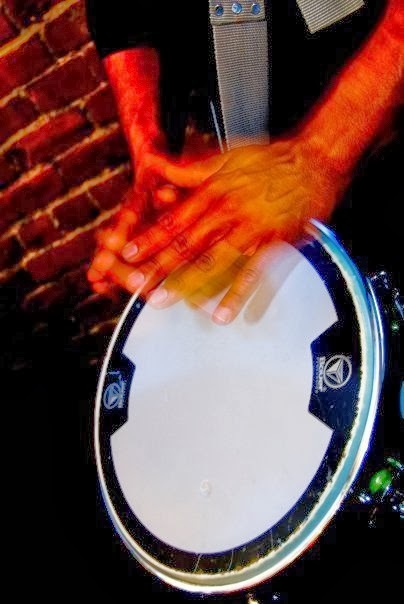 As a performing musician, Pedro has been a percussionist and trap set player in various ensembles from 100-piece samba schools, big band salsa groups, 10-piece Latin/funk bands to R&B and Hip Hop trios and quartets. He is one of the founders of San Francisco’s based Latin/Soul/Funk band Bayonics. Touring Latin America, the U.S and the Caribbean, Pedro has had the opportunity to share the stage with greats like Chucho Valdes, Giovanni Hidalgo, Santana, Cultura Profitica, Steel Pulse, Katchafire, J-Boog, Wu-Tang, Common, The Black Keys. Pedro has also worked with Al B sure, Eric Roberson, Jaguar Wright, Yazara, Jorge Alabe, Lady Alma, John Santos plus many more! As a recording musician Pedro has accomplished multiple full length original albums and has collaborated on various others. Pedro began is teaching career at the age of 17 as the lead drummer for Loco Bloco Drum and Dance Ensemble. He went on to become the lead percussion teacher for the organization as an arts educator throughout out the San Francisco Bay Area and abroad. He has also been on the faculty at San Francisco State University, where he was the accompanist for various classes in the dance department. At June Jordan High School for Equity in San Francisco his classes explored the evolution of the drum, its origin and the influence of traditional Afro-Diaspora music, song and dance has played a part in the world socially, culturally and politically. Pedro now concentrates his time as the Musical Director for Loco Bloco. Working with instructors to create curriculum that focus on youth development and arts education. As a part of his continued professional musicianship Pedro uses his experiences and resources to help cultivate the next generation of inner-city artists.